This article is a part of the project 'Promotion of the Ottoman Cultural Heritage of Bosnia and Turkey' which is organized by Monolit, Association for Promoting Islamic Arts and supported by the Republic of Turkey (YTB - T.C. BAŞBAKANLIK Yurtdışı Türkler ve Akraba Topluluklar Başkanlığı / Prime Ministry, Presidency for Turks Abroad and Related Communities). Turkey’s Republican period often conflated modernity and progress with complete Westernization. From this perspective, all traditional Islamic arts were framed as outdated and, perhaps, as even insignificant. Tezhip survived its repudiation due to a small group of artists, among them Rikkat Kunt, Ismail Hakki Altunbezer or Suheyl Unver, who kept the tradition alive and passed it on to a new generation. Today, the art of illumination is, in fact, thriving and finding new adepts and new publics both within Turkey and beyond. Contemporary müzehhips look back, however, not to the pre-Republican period, a time when European tastes and motifs were widespread in the art, but rather to the 16th century considered its golden age. The art of Islamic illumination is linked to the upper classes in that illuminated, handwritten, one-of-a-kind manuscripts were expensive and often produced in the royal naqqashhane or atelier. However, tezhip has always encompassed a spiritual dimension, because it is profoundly linked to the Holy Qur’an and other Islamic religious texts that it embellishes. Important tezhip artist and scholar, Professor Dr. Çiçek Derman once described tezhip in these words: “If the aim of the hattat is to write the Holy Qur’an in his best handwriting, the aim of the tezhip artist is to illuminate it to express what is in their heart.” The master’s words bring us to one of Derman’s students, Fatma Özçay, who appears to have fully taken them effectively to heart. Fatma Özçay, Classic Tezhip, 2017, 14x10,5cm, handmade polished paper, water color and pure gold. Encouraged by her two elder brothers Mehmed and Osman Özçay, both master calligraphers, Fatma began her study of tezhip in 1988, not that long after her family had moved to Istanbul from the city of Gerede in the northwestern province of Bolu, where she was born. Fatma studied for two years with Dr. Çiçek Derman, who was then teaching at the Kubbealti Foundation for Art in Culture. Ever since, Fatma has not stopped perfecting her skills and examining inspiring illumination works from the golden age, whether those of Karamemi or those unsigned whose brilliant artists remain unknown. Tezhip remains Fatma Özçay’s passion: as she often says, once you get the taste for the art, everything, except family, comes second. Fatma Özçay,İkra with halkar tezhip, calligraphy Osman Özçay, 2008, 35 x 26 cm, hand made polished paper, brown acrylic ink, water color and pure gold. 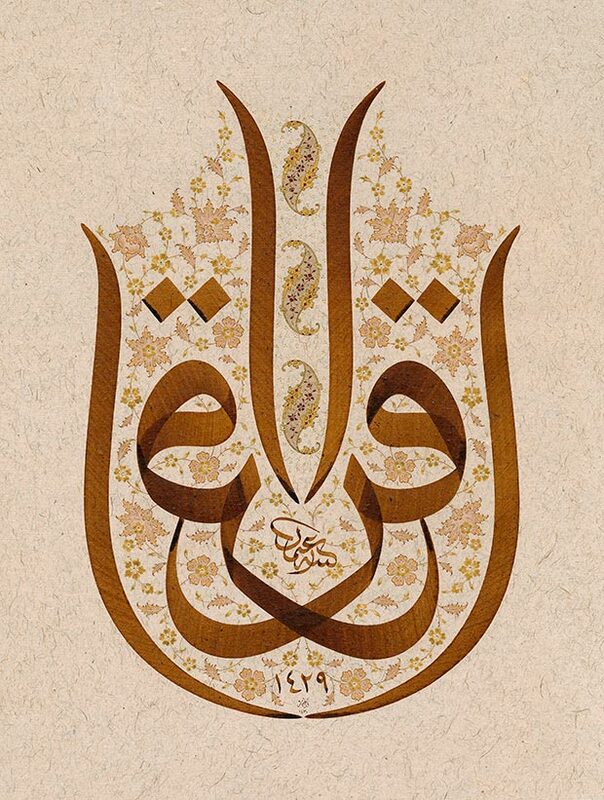 Fatma Özçay, Surah al-Imran, Ayah 159, with halkar and classical tezhip, calligrapher Osman Özçay, 2011, 57 x 41 cm, handmade polished paper, black handmade ink, water colour and pure gold. Fatma Özçay has achieved national and international recognition in the world of traditional Islamic arts through her work distinguished by its refinement, precision and classical inspiration. The artist often designs and executes the illumination for the works of contemporary calligraphers, most particularly those of her two brothers. However, Fatma increasingly presents and exhibits tezhip alone, akin to the art of painting. As she told me, “Now I want to do a different style of tezhip without calligraphy and with new ideas that show my own character, because I feel more free doing only tezhip artwork.” This demonstrates an adaptation of tezhip to modern concepts of art. Some of these works, 'Zahriye' (2017), for example, are rooted in the classical Ottoman style, while others, like 'Dreams', are modern in conception and disregard the canonical rules of the art. This is an interesting development for the artist who was once against such innovations and who believes that it is possible to make innovations within a style deemed classical without breaking the basic rules. Fatma Özçay L. Halkâr panel, 2015, 54x34 cm / R. Zahriye page, 2004, 9x14 cm / Both handmade polished paper, water color and pure gold. Fatma Özçay, Classic Zahriye with Nun, 2009, 46x46, handmade polished paper, water color and pure gold. Fatma Özçay, Dreams, free tezhip panel, 2017, 18x16cm, hand made paper, water color and pure gold. Fatma Özçay, The butterfly of dreams, 2017, 8x9,5 cm. Handmade polished paper, water color and pure gold. Fatma Özçay, Classic Zahriye, 2017, 39x39, handmade polished paper, water color and pure gold. In 2008, Fatma Özçay became herself a teacher. She now transmits the art of tezhip to her own students at the Classical Turkish Arts Foundation or Klasik Türk Sanatlari Vakfi in Istanbul. While the artist enjoys working with students, she is aware of the heavy responsibility that a tezhip teacher carries, because he or she not only has to teach the craft, but also has to be an exemplar of the characteristics that the art requires, like infinite patience, generosity, delicateness and piety. In sum, teaching also offers her the opportunity of seeing and working on herself. Through both her teaching and practice, Fatma Özçay helps to carry the rich tradition of tezhip into the present-day, chaotic world where its beauty and quietude are sorely needed.